On Friday 30th November I’ll be taking part in the Midlands Experimental Moving Image Collective’s first salon, entitled Warpaint. It’ll be held at Althorpe Street Studios & Gallery in Leamington Spa [map] from 7pm. 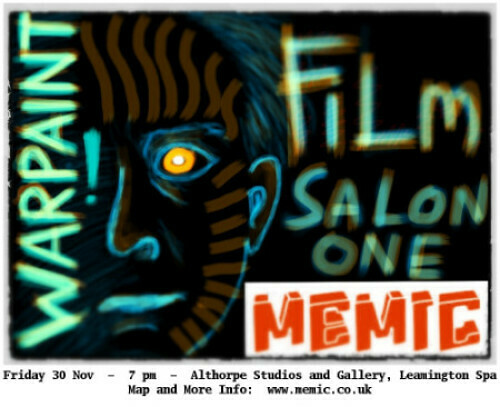 MEMIC Film Salon 1: Warpaint is the launch event of MEMIC (Midlands Experimental Moving Image Collective). Come along for a screening of a program of artists’ film and video accompanied by an exhibition of moving image installation works. Including work by artists from around the Midlands (many of whom will be in attendance), as well as work by a number of international artists.